← Become a TNA member and consider joining the Board of Directors! 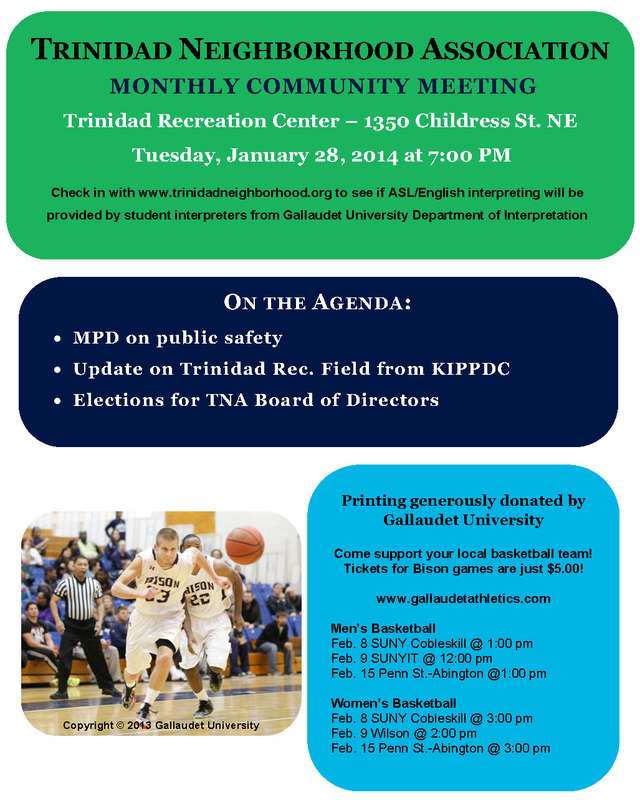 Please join us on January 28 at Trinidad Rec Center! This month, TNA will hold an election for a new Board of Directors, and we can’t do this without you! For more details on how to join TNA for just $5 per year, and on what it means to be on the Board of Directors, please see this post. Additionally, MPD will share community updates on crime and safety, and KIPP DC will update us on the renovation of the Trinidad Rec. field. A big thank you to Gallaudet University for sponsoring our flyer printing. If you are able to help distribute flyers, please stop by 1218 Oates St. NE and grab a handful from the box on the fence—your assistance is much appreciated. Posted on January 15, 2014, in Meetings and tagged KIPP DC, TNA. Bookmark the permalink. Leave a comment.